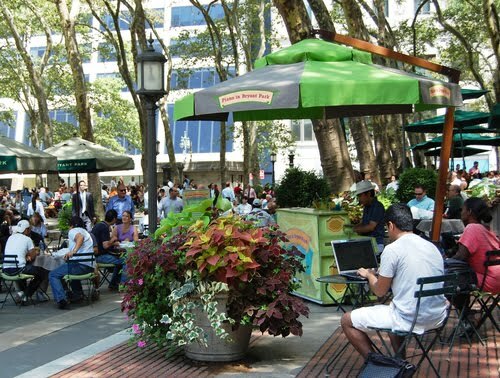 As the weather gets warmer the list of things to do in Bryant Park grows longer and longer. This week, in addition to Bryant Park Petanque Lessons, Ping Pong, Chess, Fencing, Birding Tours, Meet the Birds, After Work Music, Game Nights at The Southwest Porch, Tai Chi, and Yoga, we’re launching three more programs for you to enjoy. After Work Music with Bill McGlaughlin & Friends debuts this evening with jazz from the Karrin Allyson Quartet. Award-winning public radio host Bill McGlaughlin curated the series which also features the Orion String Quartet, Mark O’Connor, Imani Winds, and Tara Helen O’Connor. Don’t forget that The Southwest Porch is offering a 10% discount to concert goers on Monday evenings, tonight through June 14. More details here. Talented New York area pianists, including Junior Mance, Frank Owens, Roy Eaton, and Ayako Shirasaki, return to entertain lunchtime crowds at Piano in the Park. Each weekday throughout the summer a different musician fills the Upper Terrace with toe-tapping jazz and ragtime tunes. Terry Waldo kicks off the first week of this season’s program, today at 12:30pm. 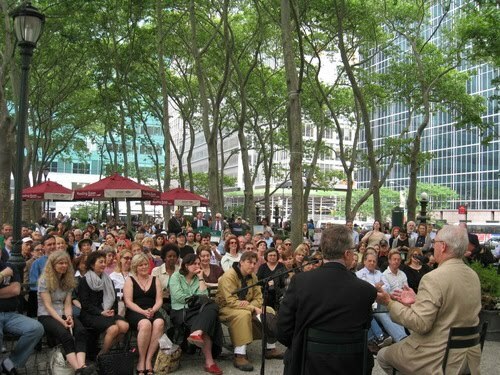 Bestselling authors, celebrity writers, and expert panelists will appear at the Reading Room this summer for our popular Word for Word Author series. Former Met and Yankee, Darryl Strawberry, visits the park this Wednesday to speak about his autobiography Straw: Finding My Way, answer audience questions, and sign copies of the book.